It was a “lightbulb moment” for Ernest Brown Jr. He was working as a youth counselor at a group home in North Carolina, trying to help troubled teens cope with the hardships and challenges of their lives. Then he began taking an introduction to psychology course at Fayetteville State University, where he was an undergraduate. Today, Brown is in his third year of pursuing his doctorate in clinical psychology (Psy.D.) at Wright State University’s School of Professional Psychology. And he is this year’s recipient of a prestigious national fellowship offered by the American Psychological Association’s Minority Fellowship Program’s Mental Health and Substance Abuse Services. The fellowship is a part of a mentoring, training, career development program for promising graduate students, post-doc students and early career psychologists. “They are aiming to increase the number of ethnic minority professionals in the field of psychology, to enhance the psychology outcomes for ethnic minorities and to better understand the life experiences of ethnic minority communities,” said Brown. Brown plans to use the yearlong fellowship, which begins in July, to tap into the expertise of clinical psychology experts and to integrate that knowledge with the work he does every day. He will remain at Wright State for the fellowship, except for traveling to various conference and training locations. He is one of two current SOPP students holding this fellowship. Brown grew up in Fayetteville, North Carolina, near Fort Bragg. He is the oldest of five children, played organized sports at a young age, but was also into reading and school. The hardships he faced prompted him to intensify his commitment to his studies with the goal of helping others. “Just growing up in the South as a young black male pretty much in impoverished conditions made me realize that others were likely experiencing similar things and worse,” he said. Brown earned his bachelor’s degree in psychology from Fayetteville State in 2006. He then got a counseling job with North Carolina’s Department of Juvenile Justice working with adolescents in detention and youth development centers. He also worked in several professional capacities in community mental health. 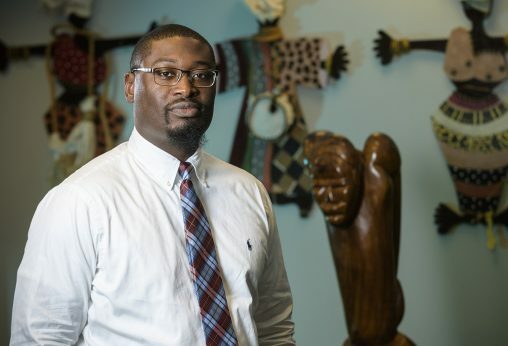 In 2011, Brown returned to Fayetteville State, where he studied counseling psychology and worked in federal TRIO programs, which are designed to motivate and support students from disadvantaged backgrounds in pursuing college educations. After obtaining his master’s degree in 2014, he enrolled at Wright State. All that was reflected in the makeup of SOPP’s faculty, staff, students and the school’s outreach in the community, he said. “Wright State stood out and was the only program I applied to because I was that sold on it just from research from afar,” he said. Brown says he is not only passionate about social justice, diversity and multiculturalism, but also about ethnic minority communities and forensic psychology. He continues to work with people in prisons, detention centers and those who have been paroled or are on probation. Using the best available research, he is working at a local probation office and — along with his adviser — does diversity-focused training with local police departments. The most difficult part of forensic psychology for Brown is dealing with the stigma attached to people who have been convicted of crimes and incarcerated. Brown, who teaches in the Rehabilitation Counseling program at Wilberforce University, the oldest private historically black college/university in the country, has a long-term career goal of becoming a chancellor or president of a historically black university. “Two of my passions — psychology and education — go hand in hand for me,” he said.